The big advantage of this cast is that it uses positive energy. Logically that means two important things: more accuracy and less effect of the wind. Applying positive energy in a cast in which the loop lands before it finishes evolving is quite unusual. This is what's so special about this cast. You don't add slack line to the system (like in the puddle left hook) precisely to increase accuracy. Use: to avoid lining fish while fishing upstream, presenting just the last stretch of line perpendicular to the current and the rest almost in line with it. A very useful way to minimize drag. To get around obstacles with this same line configuration. 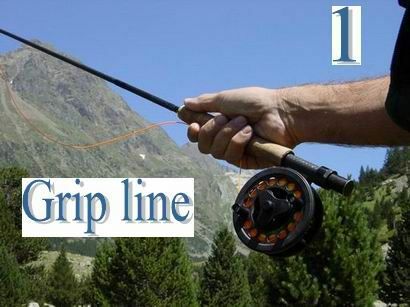 Description: the line is perfectly straight from the rod tip to the last stretch, which, together the leader, form a 90º hook to the right. Execution: in an overhead cast, stop the rod energetically with a rotation of your wrist on the axis of your forearm inwards (towards yourself). At the same time, smoothly lower the rod tip. All these motions must be fluid and delicate. size of the hook: depending on how much you rotate your wrist. 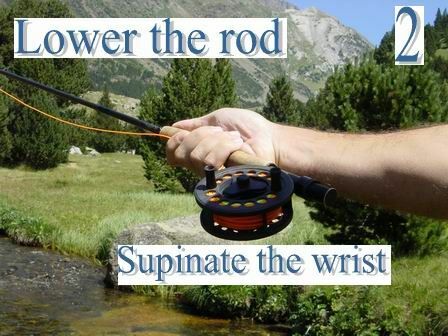 For large hooks, move your arm slightly to the left as you rotate your wrist. you're rotating your wrist too late and not just at the instant of the stop. you're lowering the rod tip too late, giving the loop time to evolve completely.